Leslie and Beatrice Jauncey became close to King and Amy (Aimee) O’Malley. Our researcher, Steve Flora, himself born a mere 900 or so kilometres from King’s probable birthplace in Valley Falls, Kansas, has become close to all four of them and has made contact with various Jauncey relatives in Australia and New Zealand. This transcribed letter comes from the King O’Malley papers at the National Library of Australia (NLA MS 460 6557–58). King’s entry in the Australian Dictionary of Biography reports King’s status as the first and only bishop of the Waterlily Rockbound Church – the Redskin Church of the Cayuse Nation, his own denomination. The Jaunceys often referred to him as ‘the Bish’. The letter bears on both Australia’s wartime (the reference to WM Hughes, who does not fare well in Jauncey’s The Story of Conscription in Australia) and economic history (Jauncey’s attitude to O’Malley’s role in the founding of the Commonwealth Bank). Bee and I were deeply grieved yesterday to receive the cable from Len Dooling informing us that dear King had passed away. We had hoped that he would see his century, but it seems that was not to be. No doubt the very hot weather in Melbourne during the past few days must have been too much for King. I had heard of King O’Malley in my very early years. My mother spoke to me about him when I was quite a child. She admired him for what he supported in public life in those days. As a youth, I admired King because of his support of those who were fighting the Little Digger’s efforts to chain Australia with militarism. Years later when I became interested in banking, my beloved brother, Eric, advised me to investigate the great part paid my [sic] King in the promotion and founding of the Commonwealth Bank. When I wrote my doctor’s thesis at Harvard as a study of that bank, it soon became clear to me that King was the moving figure in that Bank’s establishment in 1911. An interesting fact about the situation during my studies at Harvard was that during my work there I did not contact King even once. I did not at that time write to him or know him. He had no influence at all on my decision to dedicate my thesis to him. Only the facts I reviewed caused me to do that. At the time I did not know that King was still alive. It was not until I reached Sydney in 1932 that I knew that King was still then alive. Meeting King in 1932 was a very happy event for me. 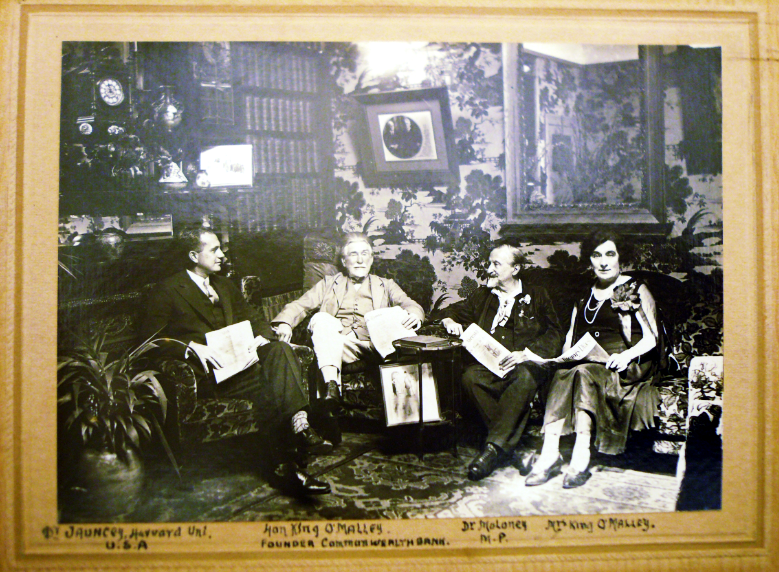 I shall always recall that Saturday evening in August of that year when I first had dinner with you both in your home. How we all chatted together about everything! I found that the more we talked, the closer our minds were on everything. King and I agreed on everything even on personalities. Then followed one of the most delightful periods of my life when amidst writing the manuscript for Australia’s Government Bank I made frequent visits to your home in Albert Park. King suggested things to me but he never tried to force any idea or programme on me. He was one of the most tolerant intellects I have ever met. He had a fine sense of humor and his stories were always amusing and pithy, ending in a point clear to everyone. I always admired King’s simplicity and his strength of character. He fought without quarter for what he believed. His opponents did not like his direct attacks towards his objective. Many times, as in the case of the Commonwealth Bank, King fought almost single-handedly for his cause. King had a long memory and never forgot his friends of the days of his great battles. Bee and I had hoped that King would live at least a few more months, but that was not to be. We are very glad, though, that Len Dooling was kind and thoughtful enough to have that fine celebration for King on his 99th birthday last July. Len is a fine man and a very strong character. Bee and I admire him greatly. Aimee, at this time Bee and I send our love to you in this great bereavement. We shall write to you a little later. I shall add just this. May the goodness and the works of King O’Malley long prevail! “May the goodness and the works of King O’Malley long prevail!” I believe that O’Malley, Jauncey and many others would be turning over in their graves now IF they knew of the privatization of the Commonwealth Bank of Australia. It is interesting to speculate upon just what a difference would now be noted in Australian society IF the “People’s Bank” had been allowed to fully function during its almost eighty-five years of existence before becoming just another “typical bank” in July 1996.